Another new event for The Birmingham Whisky Club... Join us and Davidoff Cigars at El Borracho de Oro (Edgbaston's award-winning tapas restaurant) on Saturday 30th September for an afternoon session focusing on the pairing of whisky and cigars. Davidoff cigars is the brand of choice for many the aficionado. It only takes a single puff on a luxury Davidoff cigar before one immediately recognises the flavours and aroma that have become much loved by the cigar community. These cigars are characteristically mild yet they do not lack any potency in flavour. They come as a welcome smoke for the veteran aficionado. The Swiss company was founded by the legend Zino Davidoff almost a century ago. Davidoffs are mainly produced in the Dominican Republic, although they were originally made in Cuba. Our line up of whisky is to be revealed, but we're looking at three delicious drams to give you a chance to enjoy the experience of cigar matching. Our cigar for the evening will be the Davidoff Signature 2000. Alongside the line up of cigars and whisky, you will also enjoy a tapas buffet from El Borracho de Oro at the end of the tasting... All included in the price. This tasting is suitable for beginners or more seasoned whisky drinkers alike! Tickets are just £35 (£30 for members of The Birmingham Whisky Club) to taste through these delicious whiskies. 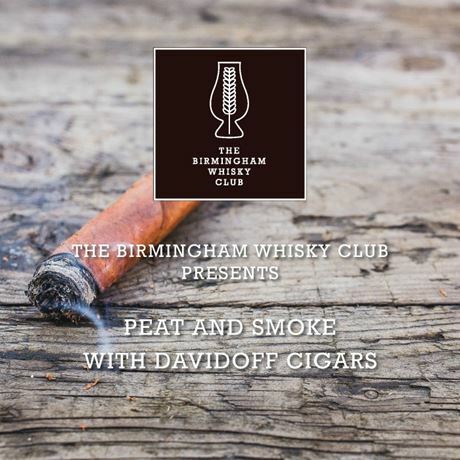 3:00pm - 3:30pm :: Be welcomed to the event by Andrew Francis (Davidoff) and Amy Seton (The Birmingham Whisky Club) and learn about the cigar making process, whilst enjoying an introductory dram and a whistle-stop tour of the whisky world. 3:30pm - 4:30pm :: We move out to the terrace to enjoy a cigar, matched to two whiskies. Be talked through the flavour profiles of both elements and ask all of your burning questions. 4:30pm - 5:00pm :: Enjoy a delicious tapas buffet, supplied by El Borracho de Oro. Feel free to ask anything you might have missed in the event and purchase further drinks from the bar. No refunds or transfers. Events is strictly over 21s Only. Tickets are sent in e-ticket format. Please bring a print out of these or have them ready on your phone/tablet for scanning on the day. By purchasing a ticket to this event you agree to your name being passed on to Davidoff Cigars for auditing purposes. *To order your Birmingham Whisky Club member ticket and claim a fantastic £5 off, please enter your code on your membership letter in the "promotional code" box in Eventbrite. If you need assistance, please email us and we will be happy to drop you a reminder. One discounted ticket available per member.